Late 2010 there were reports that the Netherlands is building 16 fast inter-city cycle routes. So what do the already existing bicycle routes between cities and towns look like? This video shows the cycle route between the towns of Culemborg and Geldermalsen in the province Gelderland*. This is not one of the 16 ‘fast cycle routes’. This is just what existing high quality cycle infrastructure in the Netherlands looks like. It is this type of cycle tracks that makes cycling from A to B fast, convenient and safe and it is what gets people of all ages and backgrounds on their bicycles, also between towns. 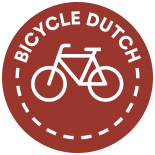 This entry was posted on 7 February 2011 by Bicycle Dutch in Video post and tagged country side, Culemborg, cycle superhighways, Geldermalsen, long distance cycle paths, ride.